My Beautiful Birds, written and illustrated by Suzanne Del Rizzo, stands apart from other books in about a thousand ways. 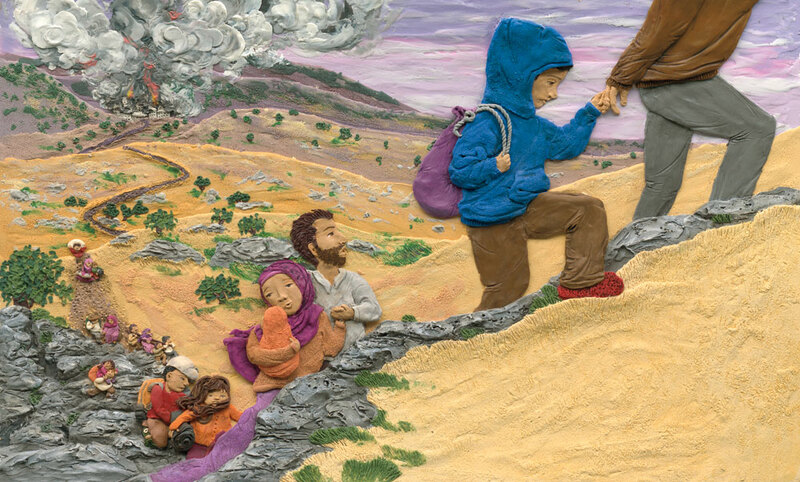 For one thing, it's a children's picture book about the Syrian refugee crisis. But more so, it's relatable, impeccably illustrated, and refuses to shy away from depicting the realistic tragedies of displacement. Suzanne stays true to the experiences children are having across the world and puts forth a story about a boy who tries to find the beauty in the ugly around him. But let's let Suzanne do the talking. Behind Sami, the Syrian skyline is full of smoke. The boy follows his family and all his neighbours in a long line, as they trudge through the sands and hills to escape the bombs that have destroyed their homes. But all Sami can think of is his pet pigeons―will they escape too? When they reach a refugee camp and are safe at last, everyone settles into the tent city. But though the children start to play and go to school again, Sami can’t join in. When he is given paper and paint, all he can do is smear his painting with black. 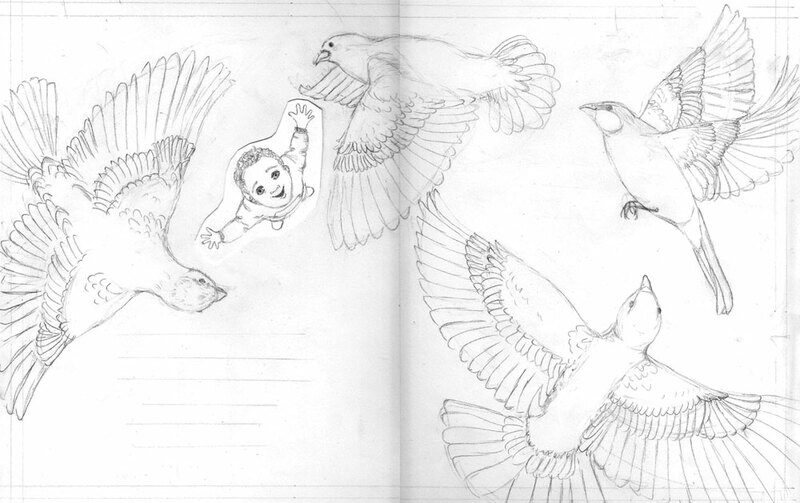 He can’t forget his birds and what his family has left behind. Let's talk Suzanne Del Rizzo! 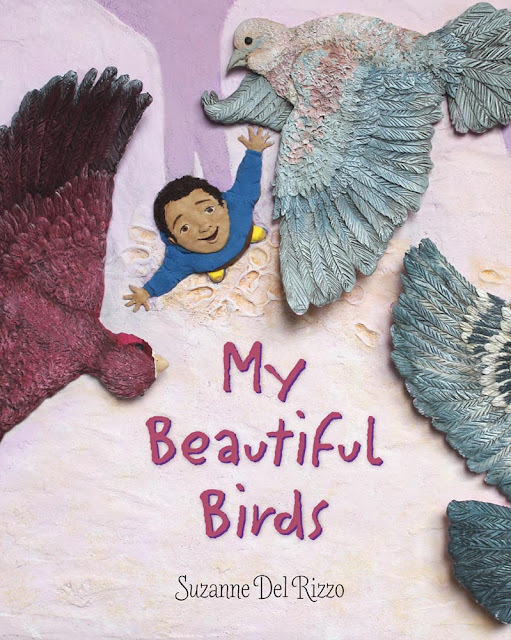 LTPB: The book flap says you were looking for books to explain the Syrian Civil War to your own children and found an article about a boy who was strongly connected to the birds in his refugee camp. What kind of research did you do to build up this boy’s story? What touch points did you create throughout to make this difficult subject accessible as a children’s book? SDR: I was researching online for more kid-friendly information about the Syrian crisis to share with my children when I came across a little article about a boy in Za’atari refugee camp who found wild birds and developed a friendship with them. I loved how this friendship transcends language and spoke to a child’s universal love of animals and the comfort they can bring during hard times especially something as traumatic as displacement. 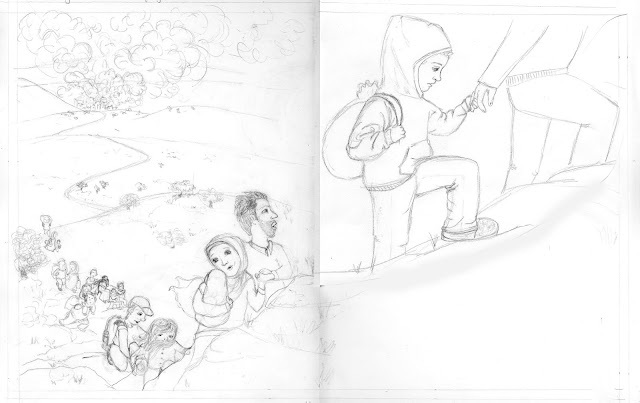 I wanted to create a story which introduces the Syrian refugee experience but also incorporates familiar, universal childhood “loves” in the hope that it would resonate with any reader. I did quite a bit of research into refugee camp life, Syrian people, beliefs, food, clothing, refugee camp day to day life etc; I wanted to ensure I was very respectful and accurate in my portrayal of Sami’s experience. Although this picture book deals with displacement, PTSD (not overtly) and the difficult subject matter of the Syrian crisis, I didn’t want to shy away from or sugar-coat these experiences, but rather depict them in an age-appropriate manner. Children are very wise and smart, and they deserve honesty in our discussions of such issues. But we must also be mindful to frame our discussions in an appropriate manner so children always feel safe and secure. Keeping these ideas in mind I chose to tell the story through Sami’s point of view, a first person account, from a child’s perspective; one with whom the reader could best identify. Similarly, introducing the universal themes of children’s “loves” -- animals, sports, and crafts/art -- encourages the reader to draw natural parallels and connections with Sami. I also chose to let my illustrations do some of the “heavy-lifting” of the more distressing imagery -- the bombed village, and Sami’s emotional breakdown. Also, we made the decision to show the bombed village receding in the distance in the illustrations to create a sense of visual separation between it and the reader. 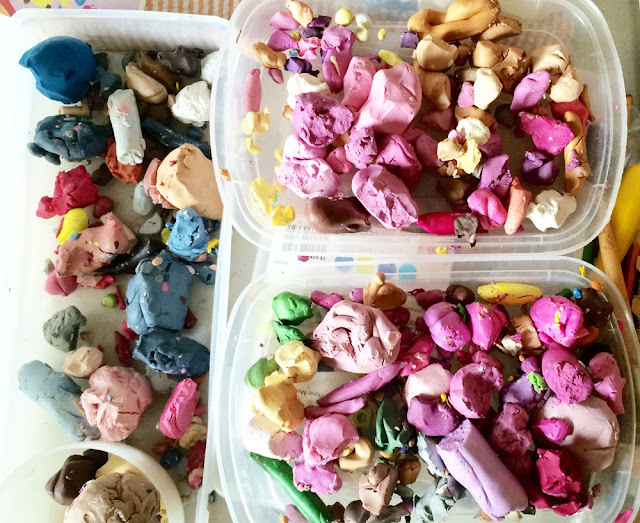 LTPB: Your illustrations are created from polymer clay and acrylics. Have you always worked in this media? What is your process like? 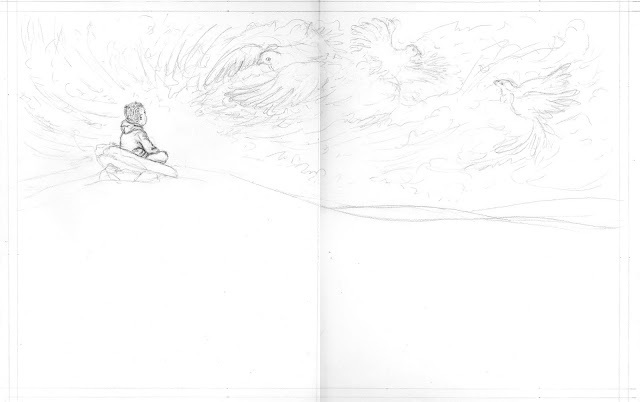 How long does it take you to create one spread? 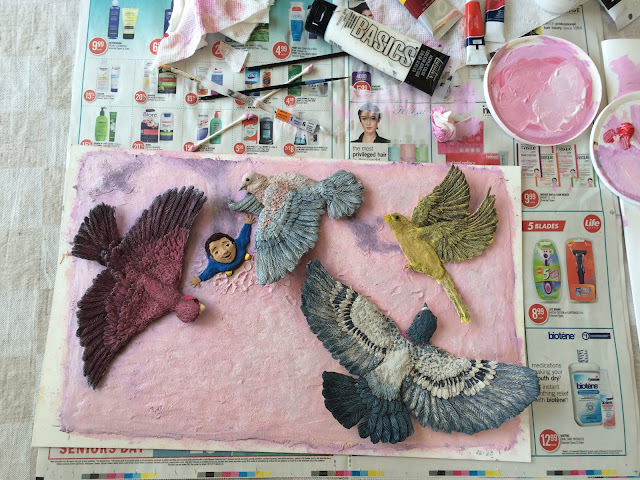 SDR: This book is the first were I have used polymer clay and acrylics to create the final art. My three other picture books, which I illustrated only, were all created in plasticine and various mixed media (such as wood chips, watch gears/components, decorative papers and maps, to name a few) to best suit the art style of each book project. I like to change things up and experiment to keep my artwork fresh and unexpected. I find working in low relief is very exciting and challenging, and I love seeing the expressions of wonder on children’s faces when they explore my illustrations. 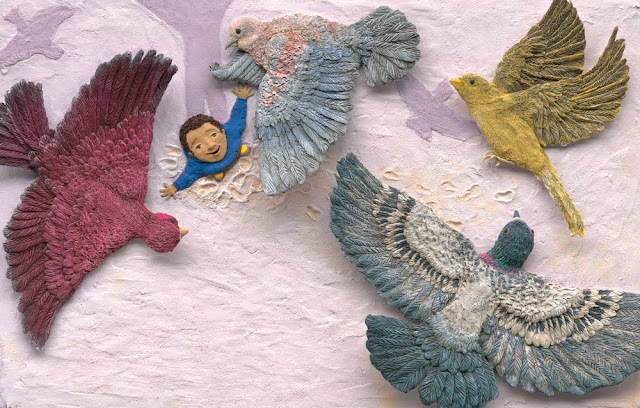 Even though my illustrations are either 3D scanned or photographed for print, there is a textural quality to my illustrations that beckons little hands to feel the pages as if expecting to feel the low relief illustration itself. My process is similar for any medium I use; I start with small loose thumbnail sketches, scale up to full size tight pencil sketches/linears. At the same time I do a few sample pieces to work out my approach/make style decisions, select my colour palette for the final art, trace my tight linears onto tracing paper, and then once linears are approved I begin the final art. I use gessoed illustration board as my backing. I work back to front, kind of like building a pizza (to borrow an analogy from the incomparable Barbara Reid). I spread/smear plasticine -- or in this project’s case, polymer clay -- in a thin layer then work up the background, checking that I am staying on track with my overlays of tracing paper. Foreground elements are added last. The completed illustration is baked in the oven to harden the polymer clay. Once cool, I use a series of acrylic washes over top of different sections to highlight texture and build up the sandy desert atmosphere. Each illustration is quite labor-intensive, and the time of completion varies depending on the complexity, amount of detail and size the illustration. I’d say a single full page illustration with detailed background and foreground could take upwards of 40 hours. I often have a few illustrations on the go at once, especially if they feature some of the same setting, so I can ensure colour continuity. LTPB: What can you tell us about the endpapers? 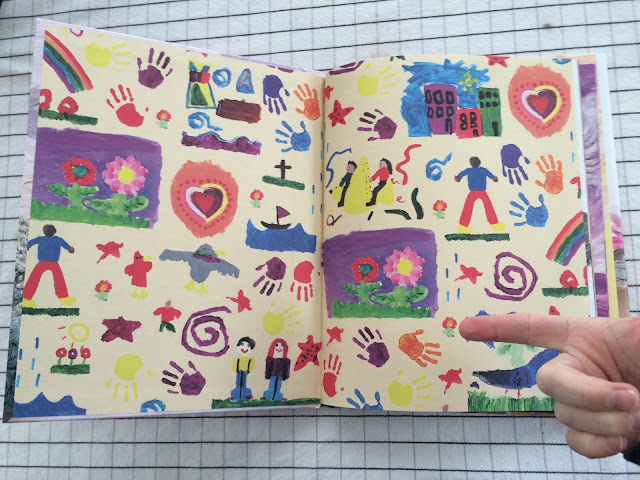 SDR: Yes, I am so excited about the endpapers. Aren’t they awesome? There is a story behind them. 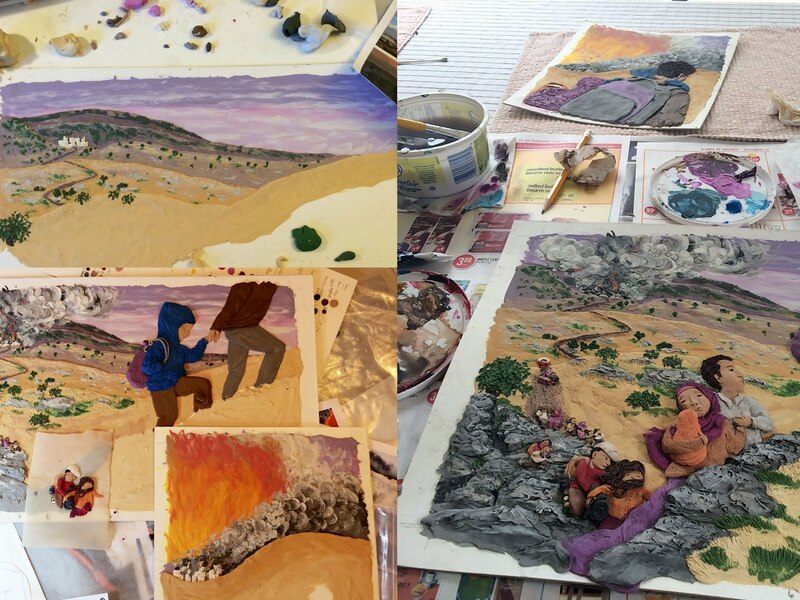 I wanted to incorporate authentic, kid-crafted paintings in my illustrations at the point in my story when Sami and his classmates make kites and paintings, so I enlisted the help of my children and their friends. I set up the kitchen table with paints and paper and gave them the simple creative prompt: “How would you feel if you were forced to flee your home and leave everything you know and love behind and live in a refugee camp?" I wanted real artwork that reflected children’s views on displacement. Once their amazing paintings were dry I scanned them into my computer, sized them down, printed them out on t-shirt transfer paper, then transferred the images onto polymer clay to incorporate them in various illustrations. My art director at Pajama Press, Rebecca Bender, and I thought it would help set the tone for the book to highlight their work in the endpapers. LTPB: You've illustrated several books, but this is your author debut. Congratulations! 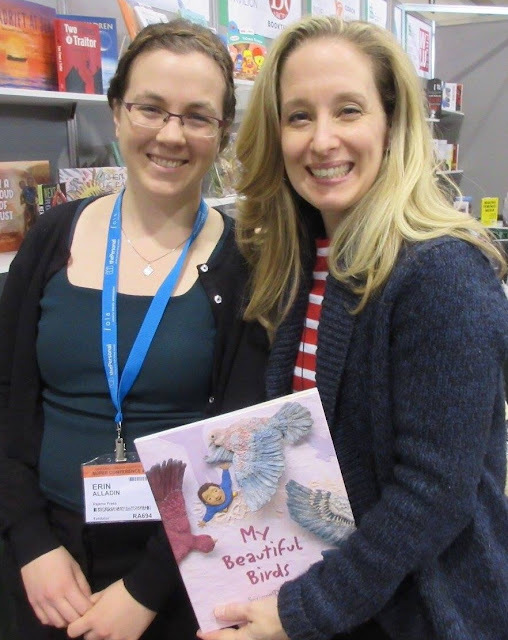 What picture books did you use as mentorship texts to help inform your manuscript? SDR: Thank you, Mel! I am so excited that this is my author-illustrator debut! It was very exciting to conceive and write the text, all the while letting my imagination flow to come up with the perfect art style to complement the story. 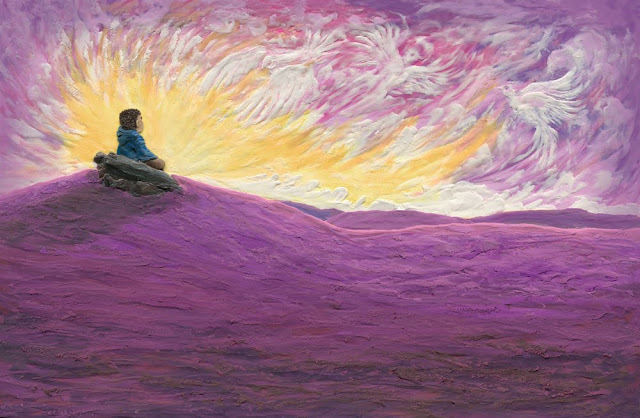 I definitely sought inspiration from some of my favorite picture books: The Promise by Nicola Davies, and The Specific Ocean by Kyo Maclear immediately spring to mind because of their gorgeous use of language and imagery. SDR: I have a few things on the go at the moment, but unfortunately as they are all in the beginning stages, I am not able to share them just yet. SDR: Gosh, that is a tricky question, there are so many illustrators that I adore. Hmmm…I think I’d have to pick Melissa Sweet. I have a huge art-crush on Melissa’s bold mixed media art. She brings such heart, whimsy and uniqueness to each project, especially her biography picture books. I really enjoy exploring other illustrators’ styles and techniques and pouring over artist’s process posts to see how they create. It is so inspiring. Some of my favorite illustrators at the moment are Elly MacKay, Erin Stead, Jonathan Woodward, Sydney Smith, Lauren Eldridge, and Cybèle Young. Thank you so much to Suzanne for creating this beautiful story for child readers and sharing her process with us here! My Beautiful Birds published earlier this year from Pajama Press. Special thanks to Suzanne for use of these images!